From the weblog of Arash Sigarchi : " Panjereh Eltehab"
At the end of October , when i saw the wound didn't get better,i visited my dentist and he pulled that tooth out. A week later , the wound become better but i did observe some abscess on the left side of my tongue and as well i felt a tumor beneath that. once again i consulted with my doctor and this time he did refere me to an ear,nose & throat specialist and at the end of October the specialist gave me some pain killer and antibiotic.When one week of taking medication didn't change anything,they decided to take a sample from my tongue for pathology and to see if the tumore is cancerous. On Monday November 27 i was admited to the hospital and they gave two sample for two differen pathology to my family and yesterday November 30th after spending a year in prison they told me that i have cancer. This is a malignant cancerous tumore in my tongue which i have tofight with it , the name of this cancer is: "Squamous Cell Carcinoma of Tongue" . First dimension , to change my life style, because some beleive that continuing bad life style, at the end will result to cancer . Unfortuanately , for a period of time i ate alot of food and only now i have returned to my natural weight. And also in these years of stresses working as a journalist, the fight for freedom of expression , unbearable crisis from the court and after prison , has weakened my soul. Second dimension, is a medical fight, which generally depends on lazer curement, chemical curement and removal of cancerous tumore. Third dimension, is the patients state of mind, we have seen people who have learnt that they have cancer , have left everything and spent the remaining time for enjoyment.Interestingly , not only they didn't die as their doctor suggested but they have lived for many years ! I have taken the responsibility of the first dimension and have made my life style better. I have given the second dimension to my cousin doctor Shahram Arvin and my medical team.But i have given the third dimension to all of you , to my father , mother, and my fiance dear Rafuneh and everyone of you that i haven't meet , dont forget me . 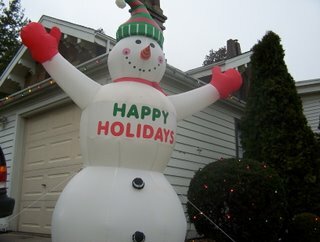 With the help of dear Rafuneh from now on i will post my daily writing ( the fight with cancer )in this house. Since some friends are interested financialy assist Arash in medical expenses , the bank account is announced here only for this purpose. Bank Account: " Cheke talaie"
University students banned from continuing their education wrote a letter to the Minister of Science and asked him that : Mr. Minister, if you have reason , why then you are insulting ? 17 university students banned from continuing their education in an open letter responded to what Mr. Mohammad Mehdi Zahedi the Minister of Science have said recently. According to the news , minister of science have insulted students and this angered them. They believe by what minister have said , he is gone so far as closing his eyes on constitution and become judge,legislator and executioner ! Background: On Thursday , minister attended among students organizations and told them that : Students with three stars in front of their names are the violators to peoples chastity. Watch Akbar Ganji - Speaking on solidarity with political prisoners in Iran! togetherness , peace and happiness! 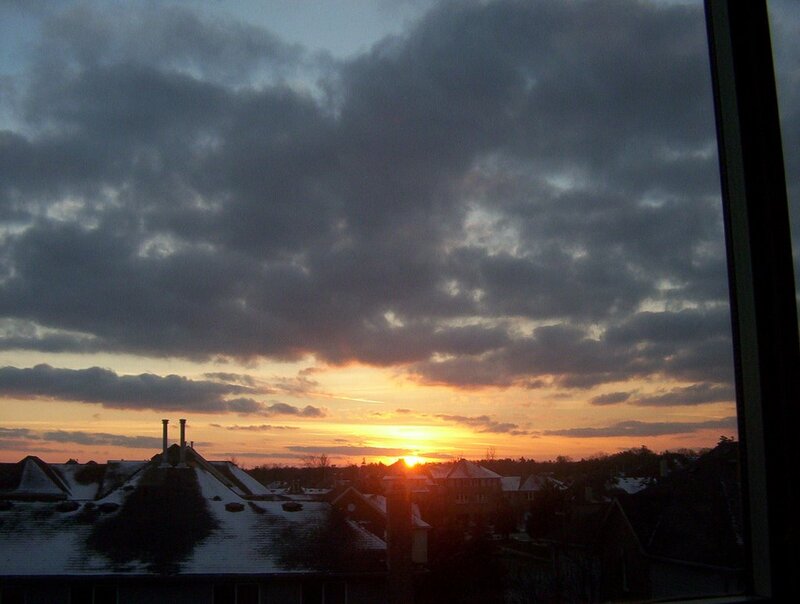 All the best for the coming new year ! Another cartoon brawl in Iran! Once again the misinterpretation from cartoon become hot business. This time the draw fell to the name of " Hamshahri " newspaper.On last Thursday, in its supplement " Rooze Haft " , on the occasion of the night of " Yalda" , a cartoon showing Santa Claus in a crescent of the moon , but the Santa looked like Ayatollah Khomeini, the late leader of the Islamic Republic. According to a report by " Entekhab" News Agency , the possibility for the closure of this newspaper have been discussed and was heared that; an urgent meeting of Media watchdog was called to review the closure of this newspaper. Meanwhile, some sources are reporting that the closure of this newspaper is coming with an order from Tehran public prosecutor office. 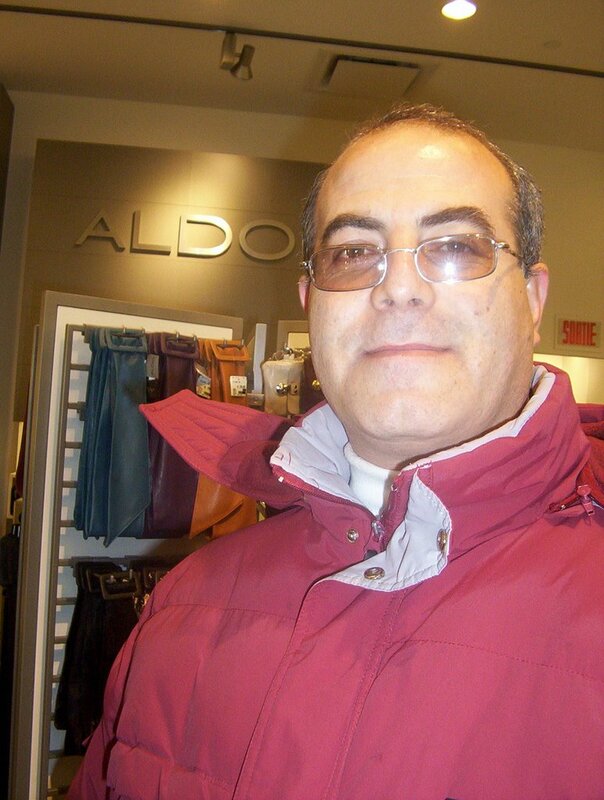 Focus on recent Arash Sigarchi's writing in his weblog. Hi, It's been quiet a long time that i haven't written in this house, it is not that because i dont want to write , if this was the case , for respecting you, i would have informed you the end of this window earlier. Fortunately, i have been accepted to University of " Payame Nour " to study law , and i have started its 2nd term from prison. On September 18, i came for a "provisional release" ( leave of absence from prison) for 10 days, while in prison our soccer team (indor type of soccer) became number one , and to this reason they have extended my provisional release for another 40 days. On Sunday November 5 after the end of my leave of absent from prison i returned again to the prison and interestingly on Tuesday( two days later ) they did let me have another leave of absence from prison this time for one month , which will end on December 7. The other point is that ; a court will review my other charges like "having a satelite dish in my home" , " insulting Hashemi Rafsanjani " and .... but did not make any sentencing and i will be going on trial again on December 10. In early September, i felt a severe pain in my tongue, like a small mouth plague and i thought by eating cooling food like yogurt it will be cured. When a few days later, i came for another leave of absence, i was trying to cure it with these type of things but it spread .After a while it wounded the lower part of my mouth and cut it by one centimeter . By counsulting with my doctor , i visited a dentist, and in the end of september he said: Since my wisdom teeth are healthy , it would be better if only one of the provoking tooth ( lower left )be scraped. According to a report from public communication office of "Khuzestan" provincial judiciary Mr. Ali Matirinejad, Mr. Malek Banitamim and Mr. Abdollah Soleymani have been executed on Saturday December 19 ,2006 . They were charged with " Action against national security of the country". 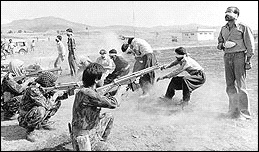 Human rights advocates like: Mr. Abdolkarim Lahiji , lawyer and vice -president of the Ligue Pour La Defense Des Droits De L'Homme En Iran(in Paris) and Mr. Emadodinn Baghi, president of the Association in Defense of Prisoners Rights ( in Iran)have said that the people who have been executed did not have the right to a legal procedure and to righteous defense. Mr. Baghi Said : When i saw i can't do anything to stop the execution , together with the families of these prisoners we met Mr. Karubi and asked him to help to stop the execution. Mr. Baghi said : Our effort is to stop execution of the next group. 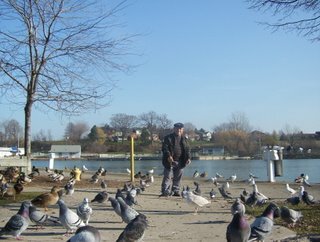 Mr. Lahiji said : Our protest is that these people do not have an open trial and right to defend themselves. In other word these people are deprived from a "righteous trial" which is common in human rights culture.Mr. Lahiji as well said : These peoples legal procedure and trial can not be called trial and appeal . Press Now conducts second successful journalism training course in Iran! From 9 until 16 December 2006 Press Now conducted a training course on civil journalism in the Iranian capital of Tehran. The course was the second workshop after the first training event that Press Now organised in Iran in August 2006. Eighteen journalists attended the course, out of which sixteen received a certificate. Participants came from a variety of Iranian newspapers, with both reformist as well conservative backgrounds. The training course aimed at making the participating journalists aware that journalism is a part of society and therefore needs to be conducted from the perspective of the citizens. The training promoted basic journalistic principles such as the separation of facts from opinions, respect for truth and for the right of the public to truth and the right of fair comment and criticism. Participants were trained in basic journalism skills, such as writing news items and feature stories and conducting interviews. The training was conducted in partnership with the Association of Iranian Journalists and was held in their premises. The trainers were Judit Neurink, editor of the Dutch Daily Trouw and Nafiss Nia, an Iranian-Dutch film maker and journalist. During the final session participants expressed their great satisfaction with the course and requested Press Now to continue the training program through (1) repeating the same training course for other groups of journalists, (2) conducting train-the-trainer programs for a selected group of participants from the August and December workshops and (3) conducting on-the-job training within some of their newspapers. In response, Press Now has expressed its interest and readiness to continue the training program during the next year. More than 220 journalists and news reporter signed a statement and protested to the behavior of the ninth government ,particularly the Ministry of Interior with news reporters during the recent election. The signature to this statement is on the rise. The statement says that : The government and Ministry of Interior put much obstacle in front of journalists and news reporters for reporting about the election, particularly on the process of candidates registration and on the election headquarter located in the Ministry of Interior . It went as far that, the minister of interior himself officially prevented to the presence of a reporter.And the Minister believe that he has all the rights to select and prevent reporters and to give orders to them and to newspapers. The recent election , based on high volume of unofficial news release and spread of rumers through unofficial news publication in comparison with past years was unprecedent . One of the problems was the delay in counting the votes and creation of barriers for journalists and reporters and limiting the flow of information. In this statement the signatories condemned the government behavior on the flow of information and the government expectation to make journalists and reporters as Ahmadinejads' government employees . As well In the statement the reporters has warned the government for such behavior and demanded the goverment to appologize. Roozna-Online news from "Etemad Meli newspaper"
UN general assembly is worried about the violation of human rights in Iran! The general assembly of UN which has 192 members, in a resolution with 72 pros vote, 50 cons vote and 55 abstension vote expressed its concern on wide spread violation of human rights by the Islamic Republic in Iran . In this resolution UN general assembly expressed its concern on matters such as persecution,bothering , intimidation, trial and punishment of groups,human rights defenders,political dissent, religious dissent, journalists, MP's, students, clergies, university professors, bloggers and members of the labor unions . The resolution have asked Islamic Republic to respect all of the rights of human for association and freedom of expression and to end the persecution and intimidation of human rights and political activists and to stop the using torture and to respect and gurantee the legal process. 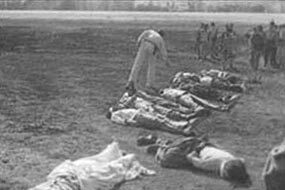 Pakistan and Zimbabwe........... were the cons to this resolution against Islamic Republic. Student movement will show itself when there is an undemocratic regime. 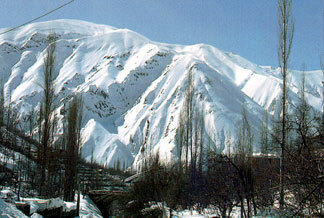 University was established in Iran in 1934 at the time of king "Reza" . 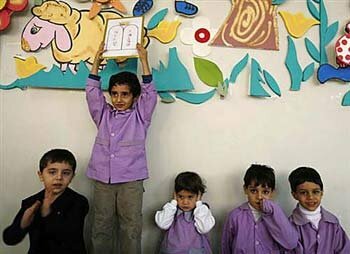 The Islamic Republic regime have planned and still is planning to bridge between " Houzeh"( school of theology) and universities.After cultural revolution in Iran which suppressed independent students as well as students with partisan politics, most especially the leftist students, and during the time of prime minister "Musavi" s' cabinet, differences came to existance and these division could be seen as left and right, it was from this time that some of the officials started to support students movement , and we can say this was the start of the student movement with a critical view to the Islamic system. After the war when "Rafsanjani" positioned himself on the top post of government, his government was known as " rebuilding government " , and he tried to strengthen his government economically and in order to make his government strong he helped for the creation of "Islamic Student Association" and " Daftare Tahkime Vahdat " .These student organizations in the 2nd round of Rafsanjani's presidency took distance to his government and when "Tabarzadi" ( one of the student leader ) criticized his government , Rafsanjani's government started to bann their student publications or close their offices and at the end Mr. Tabarzadi was arrested and was imprisoned and by his arrest this problem finally was set aside. After this, Inside " Daftare Tahkim Vahdat" progressive ideas was formed and this student organization stood against the officials , after few other governments came to power and gone , new generation entered in the university and students demands went toward the freedom , in the presidential election of 1997 " Daftare Tahkime Vahdat " supported Khatami and as a result many voted for Khatami , in previous years students were used as a tool , but this time they demanded for freedom, and because of these demand many vote was given to Khatami and he was elected. This was a general picture up to " Dovome Khordad" (the start of reformist government of Khatami ). After " Dovome Khordad" there were two major groups in student movement ,1- " Daftare Tahkime Vahdat " supported by reformists and had office in the universities 2- United Student front .The 2nd organization didn't have offices in universities, Tabarzadi belonged to this front, ministry of information tried to defame him. At that time , passing Khatami was a red line, and because the members of the 2nd organization wanted to pass this red line most of its members were arrested.
" Daftare Tahkime Vahdat " every year had meeting on " Dovome Khordad" ( when Khatami was elected as president ) and " Shanzdahe Azar" ( Student Day in Iran ) and Khatami was invited to these meetings for speech. Gradually " Daftare Tahkime Vahdat " became stronger and as well the reformist government and since reformist government after taking power wasn't paying attention to " Daftare Tahkime Vahdat" , so "DTV " became critical to the government of Khatami especially in his 2nd term . 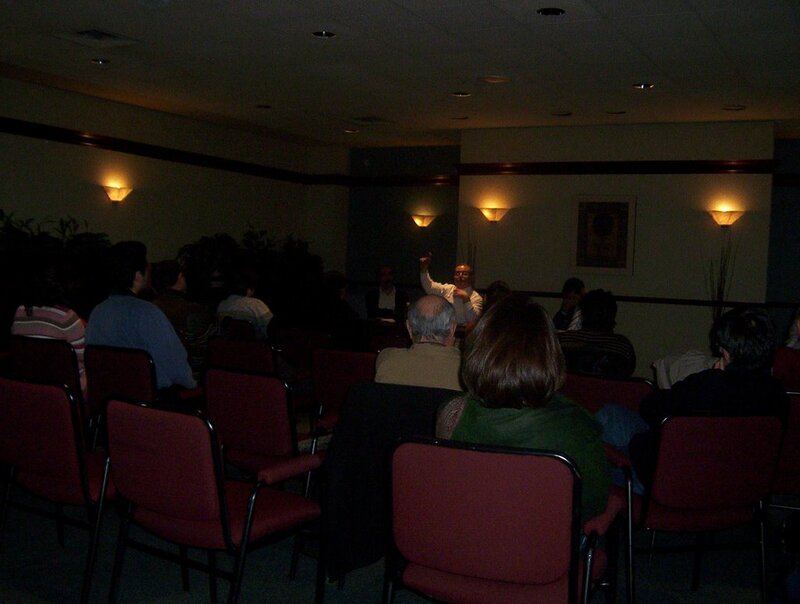 Because of this the security organizations were advicing them to stop their criticism of Khatami . When the leader like Ali Afshari was arrested, from Khatami's office a call set him free after 2-3 hours of detention.It was right after this that "DTV" became more radical and more arrest came on: "Ahmad Batebi" , "Akbar Mohammadi " , myself and ..... were arrested. At that time we were in "Touhid" prison , our families thought that we may be executed and the government wnted to see the student movement under control. After the release ,some of the student became united and the government could see that the students movement is becoming stronger. When students were demonstrating , teachers also went on demonstration and the Ministry of Information infiltrated inside "DTV" , because of this and other problems " DTV" was divided to two faction, in one side was "DTV- Alameh" and the other "DTV -Shiraz" . At present "DTV " doesn't have any affiliation with government. 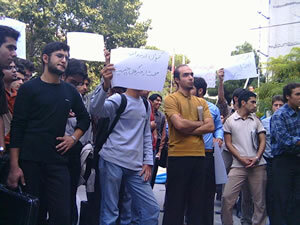 Today there is demonstration in Amirkabir University . Student movement must go ahead . More than 100 student publication was banned. Ministry of Information has planned for another cultural revolution like before, but unique in its kind. So far We have witnessed arrest, imprisonment, expulsion and we are also witnessing the regime is making students with stars beside their name , they use different tactics, like; they do contact with families of students , specially the mother and they ask her to put pressure on their childeren.They want to bring and continue an atmosphere of intimidation and fear. This is part of the speech and not all. Pictures says it all ! Repeat with us freedom , freedom ! 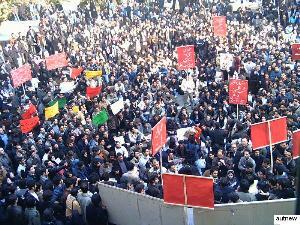 Dec 6, 2006 Iranian student demonstration for freedom! Today was the election day in Iran ! Election for "Khebregan" assembly ( an assembly of Ayatollahs or assembly of experts , in case of the death of Khameneie, the leader , they apoint new leader from among themselves for the Islamic Republic ) and election for city councils . 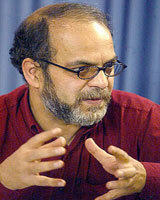 Mashaollah Shamsolvaezin, journalist and president of the" Association in Defense of Press Freedom" in speaking with "Aftab" newspaper, like many other reformists have asked people to participate in the election and said: "Boycotting the election is suicide , voting is a right for the people and they must do vote. He also said that: "There must be pressure on government in order to have a free and healthy election and also government must pay attention when counting the ballot and to computerize the counting for lowering the possiblity of cheating and to protect peoples vote". 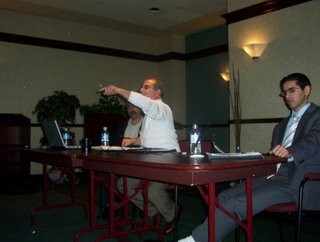 Mr. Shamsolvaezin believes that; the reasons of those who want to boycotte the election is not sufficient , and he said: There are two groups who do not want to participate in the election , one that does not have enough political experience and the other one fundamentally disagree with the Islamic system". "Politechnic" University student burnt the picture of " Ahmadinejad" president of the Islamic Republic inside the university! 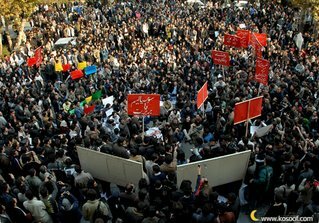 On Dec. 11 ,2006 , student of "Politechnic" Amirkabir University in Tehran has protested to the presence of Ahmadinejad in the university. He was invited by pro-government student organization such as "Basiji" students ( informer students )and while he was delivering his speech a sonic bomb was exploded and because of students protest and their slogans against dictatorship, presidents' voice could not be heard. 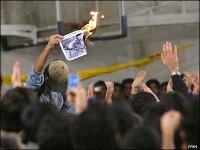 Students as well burnt the picture of Ahmadinejad . Mr. Abdollah Momeni a student leader in speaking with ILNA have said: "The undefendable internal & external policy of Ahmadinejads' government which caused problems for the iranian inside and as well brought threat against our country from foreign countries and also we have witnessed during the past year the pressure on students was intensified and their rights has been violated". Mr. Momeni said : When students find president not honest and they have been humiliated by president, then these protests become natural . Students protest on Dec. 11,2006 is in continuation of a series of protest which started with protest in the streets and as well in front of parliament by those students who are unable to continue their education because of the stars beside their names.
" Media situation & Student movement in the last decade in Iran "
Journalism in Iran has a special way , in a country like Iran there are three angle of view and in all these angles journalists are condemned . The people also think that the journalists are government mercnaries . There are problems between people and government. Every government that took the office brought new definition of journalism, it's like defining mathemathics again , up to now the government did not give its definition of journalism,still the government think that we the journalists are spy.They always put a big question mark on journalists, from Iranian living abroad also the journalists are under question mark.Journalism in Iran has three categories : 1-Independent journalism/ journalists 2- partisan journalist 3-political journalists . 1- Independent journalists : Are able to find work somewhere and editors can not influence their openions on them , these journalists' articles are free from editors viewpoints. 2- Partisan journalists / Governmental journalists: Newspapers such as " Khorasan ", " Keyhan", " Ghods" and many others ........ many of these newspapers or journalists writes part of the news and by reading it we can understand what is going on in the government. Political journalists - These journalists are unprofessional and unexperienced , these are journalists that has sympathy with government or with non-governmental organizations . Political journalists' income comes from another sources. 3- Professional journalists : These journalists have finished their study in one of the universities and their source of income is from their journalistic work.these journalists have clear understanding from the situation. Journalists in Iran are not insured and they do not have insurance and when a newspaper is closed journalists have no source of income , as a result they can't pay their rent and can't buy foods , so they go and live with their parents again. journalists that are from citys and rural areas , these journalists are the most oppressed journalists in Iran, its because sometimes we do not know for example how many of them from "Bluchestan" province or " Azarbayejan" province are arrested or are in prison. I know for example in Azarbayejan there are 4-5 journalists who are in prison and no one knows their names. In Iran there are so many kind of journalists , for example one calls himself a moslem journalist and another ...... all of them call themselves journalist ,no one help the other if the other journalist is arrested. Our journalistim society do not believe in themselves, we have a lot of problems among ourselves, we do not defend each other , thats why when the regime arrest us no one comes forward in our defense. In the history of journalism , we have Mr. Fatemi who was tied to two horses and his body was dismembered , in our history we have 12 journalists that were working with Mr. Fatemi and all of them were slited, again in our history in constitutional revolution , hundered years ago we have journalist who have been slited . We are impatient nation .We have raised our kids as revolutionaries , that means instead of teaching them to work with software , we thaught them with hardware. We are impatient and we do not want to do research work , Our modern history continuously repeating itself and the government dont like us , the governments have always saw us as security threat. Newspaper in Iran is very cheap but our people can buy with that mony four pieces of bread. Our people as always do not want themselves to confront with the regime and therefore expect journalists to go forward and start fighting for them. Since ultraconservative President Mahmoud Ahmadinejad came to power in June 2005 with a team consisting above all of former revolutionary guard commanders and intelligence officers, the repression of journalists in Iran has become more subtle and less visible, but it continues to be as effective as ever and to maintain Iran's position as a leading violator of free expression, said Reporters Without Borders. Using arbitrary arrest and incarceration to decimate its independent press, the Islamic Republic has been the Middle-East's biggest prison for journalists and cyber-dissidents since 2000. Nowadays fewer journalists are imprisoned in Iran but this does not mean the authorities have relaxed the pressure on the press. Journalists are now often released provisionally after several days or weeks in detention, but no date is set for their trial, still less for their acquittal or the withdrawal of charges. Sometimes they are given prison sentences without ever being ordered to report to prison. Prosecutions that are delayed and sentences that are not implemented are threats that hang over journalists and prevent them from writing freely. The Ahmadinejad government and the judicial authorities have turned the entire country into the region's biggest open prison. Most independent journalists or journalists who do not work for the government media are targeted by the authorities. One way or another is found to prevent them from working. At the same time, prosecutions are initiated against them and they have to pay large sums in bail (up to 60,000 euros) to get a provisional release while waiting for the case to come to trial. These journalists are unable to work any more after getting out of prison. On the one hand, they are afraid of writing another article that might displease the authorities. One the other, many editors and publishers get clear instructions not to hire them. In some cases, the arrests of journalists are accompanied by the closure of the media outlet they work for. The pro-reform daily "Rouzegar" was recently banned by the Press Surveillance Commission after giving jobs to journalists from the daily "Shargh", after "Shargh" was closed down by the authorities on 11 September 2006. The culture minister and Tehran prosecutor Said Mortazavi had sent the editor a list of journalists to fire, including former detainee Ahmad Zidabadi. The daily "Vaghayeh Ettefaghieh" was similarly closed down in September 2004 after hiring many journalists from the daily "Yas-e no", which had itself been shut down in February of that year. The order closing "Vaghayeh Ettefaghieh" mentioned the fact that most of its staff came from "Yas-e no". The same year, the authorities tried to pressure the publisher of the daily "Jomhouriat" to dismiss his editor, Emadoldin Baghi, a leading pro-reform figure in the Iraqi media and press freedom advocate. After refusing to comply, "Jomhouriat" was itself finally closed on 18 July 2004. Iranian journalists who choose to work for independent media are singled out for constant harassment. The cases of Issa Saharkhiz, Mohammad Sedigh Kabovand and Saghi Baghernia illustrate the plight of journalists in Iran. All three could be thrown in prison at any moment. Saharkhiz, the editor of the monthly "Aftab" and the business newspaper "Akhabr Eghtesadi", was sentenced on 14 June of this year to four years in prison and a five-year ban on working as a journalist for "offence to the constitution" and "publicity against the regime." His lawyers were not notified of the verdict until 21 November. Although he has 20 days to appeal, Saharkhiz has refused to do so in protest against the arbitrary nature of his conviction. "Iranian justice takes its orders from Ayatollah Khamenei," says Saharkhiz. Kabovand was the editor of the weekly "Payam-e mardom-e Kurdestan", which was published in both Kurdish and Farsi until its closure by the authorities in 2004. He was sentenced on 18 August 2005 to 18 months in prison and a five-year ban on journalist activity for "disrupting public opinion and disseminating separatist ideas." He was summoned by the Office for the Execution of Sentences on 22 September of this year, two years after the sentence was handed down. Baghernia, the publisher of the business daily "Asia", was sentenced by the Tehran Supreme Court on 19 August to six months in prison for "propaganda against the regime" in the 5 July 2003 issue of "Asia", which included a photo of Maryam Rajavi of the opposition People's Mujahideen. Her husband, Iraj Jamshidi, the newspaper's editor, was arrested on 6 July 2003 for the same reason and was sentenced to a year in prison. Baghernia received her second summons to report to prison in early November, but has not been arrested. Since the start of 2004, Reporters Without Borders has registered more than 30 cases of journalists fleeing Iran to escape prosecution. Mr. Abbas Abdi, Mr. Abbas Kakavand, Mr. Abbas Dalvand, Mr. Abolfazel Vesali , Mr. Abolghasem Golbaf, Ms. Azam Taleghani, Mr. Ahmad Zidabadi, Mr. Akbar Ganji , Mr. Ali-Hamed Iman, Mr. Ali-Reza Jabari, Mr. Ali-Reza Redjaï, Mr. Ali Reza Alavitabar, Mr. Amin Movahedi, Mr. Ali Mazroi, Mr. Arash Sigarchi, Mr. Behrouz Gheranpayeh, Mr. Bjjan Safsari, Mr. Ejlal Ghavami, Mr. Ezatollah Sahabi, Ms. Fariba Davoudi Mohajer, Ms. Fatemeh Kamali, Mr. Firouz Gouran, Ms. Fatemeh Govarai, Mr. Hassan Youssefi Echkevari , Mr. Hoda Saber, Mr. Hossein Ghazian, Mr. Hamed Motaghi, Mr. Kivan Samimi Behbani, Mr. Majid Tavaloui, Mr. Iraj Jamshidi, Mr. Latif Safari, Mr. Madh Amadi, Mr. Mana Neyestani, Mr. Mashallah Shamsolvaezin, Mr. Masoud Bastani, Mr. Mohamad Ghochani, Mr. Chammad Hassan Alipour, Mr. Mohammad Sedigh Kabovand, Mr. Mojtaba Lotfi, Mr. Morteza Kazemian, Ms. Narges Mohammadi, Ms. Noushin Ahamadi Khorassani, Ms. Parvin Ardalan, Ms. Parvin Bakhtiarynejd, Mr. Reza Alijani, Ms. Saghi Baghernia! , Mr. Saide Madani, Mr. Said Saedi, Mr. Shadi Sadr, Mr. Siamak Pourzand, Mr. Taghi Rahmani, Ms. Tonya Kabovand, Mr. Yosef Azizi Banitrouf and Mr. Mohammad Javad Roh. The information contained in this capsule report is the sole responsibility of RSF. In citing this material for broadcast or publication, please credit RSF. 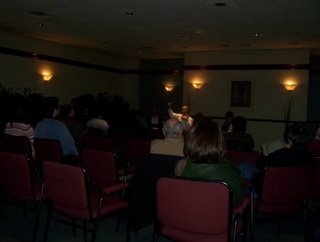 Sunday December 10,International Human Rights Day , I was in Montreal to participate in a meeting in Concordia University organized by " Bonyade Sokhane Azad" and "Association of Human Rights - Montreal " . 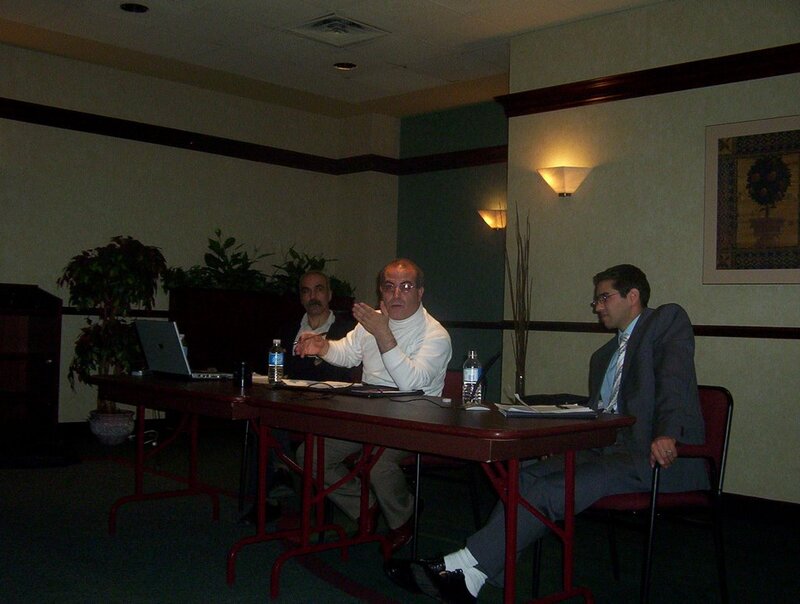 The guest speakers were: Mr. Ensafali Hedayat , the Iranian journalist who have been imprisoned for many times , Mr. Hedayat have left Iran and now live in Toronto-Canada with his wife and four childeren. 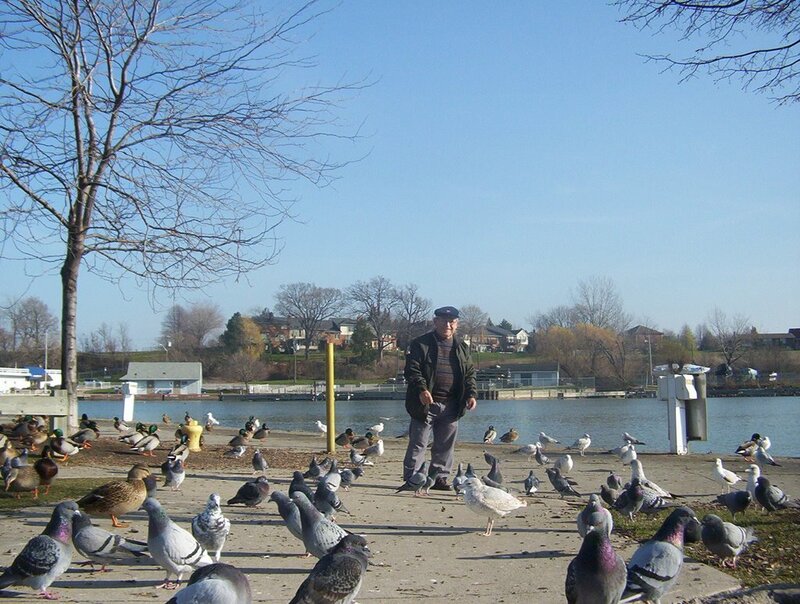 The other speaker was Mr. Hassan Zarezadeh Ardeshir , journalist and student leader , Mr. Zarezadeh was also in prison for many times and now live with his wife in Toronto-Canada. Soon IRAN WATCH CANADA will write about the speech. 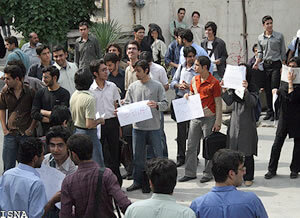 Interior ministers speech in " Shiraz University " confronted with students' strong protest ! Mr. Poor-mohammadi the Islamic Republics' Interior Minister for a speech, question and answer have travelled to Shiraz University but because of students protest it ended with convulsion. According to ILNA , this session was organized by "Association of Culture and Politics" , "Basij Student", " The Society of Islamic Students " and "Independent Islamic association of Shiraz University" with presence of SU president and other officials . The minister was invited by pro-regime students of SU , the protest started when the host MC did not use the word " Independent " when a student from Independent Islamic Association asked question, at this moment all students by shouting " Independent " showed their protest. In another question minister said that: Report by "Basij" can be used in approval or rejection of individuals competency. This part of ministers reply again confronted by protest and many in the auditorium booed the minister . Students were questioning minister for the expenses of his travel and they believed that the minister is here to gain more support for the next election. Another student who said , the minister is speaking about law , i want the minister to answer based on what article of media law the student publications before printing must be reviewd ? About students with star beside their name ( who cant enrole because of this) , minister said : Among 14000 students , 50 persons have been summoned to the deciplinary committee which is natural . At this time many students shouted : " For what crime?" which was supported by many students. This is a very very sad news for me. I hope Arash will come out of this healthy. Arash Sigarchi is diagnosed with cancer of (Squamous Cell Carcinoma of Tongue) ! Arash Sigarchi , blogger and journalist who was sentenced to 3 years in prison, recently came for leave of absence from prison. Arash in his blog reported that he has been diagnosed with cancer . 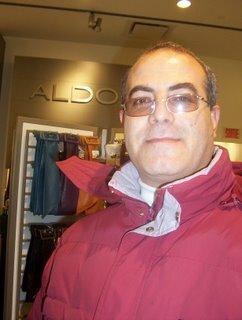 IRAN WATCH CANADA will follow and report to you about Arash . University is not Garisson ! For nearly a month, under the pressure of certain security and religious organizations, Tehran’s Sunni community has been unable to observe any religious ceremonies or even attend Friday prayers. As a result, Tehran’s Sunnis have picked a number of representatives to meet with government officials and inform them of their problems and restrictions. While the Islamic Republic officially claims that it does not discriminate between the Shiites and the Sunnis, recent reports indicate that certain religious institutions that receive governmental funds have begun a widespread propaganda campaign against the Sunni faith in Tehran. Such actions have caused concern in the country’s Sunni populated regions, particularly along the Western borders. Last Wednesday, the Organization for the Defense of Human Rights in Kurdistan called for the protection of the rights of Iranian Sunnis in an open letter. The organization also raised concerns about the possibility of a deeper confrontation between the Islamic Republic and the country’s Sunni community, calling on the government to attach priority to the prevention of such a conflict. A kindergarten for jewish kids living in Iran! Population of jewish in Iran is about 25,000 , this is the biggest population outside of Israel .Jewish lived in territory of " Fars" (Iran) for more than 3000 years.Jewish make 1% of Irans' population .Jewish like other religious minorities are descriminated daily for their basic rights by the Islamic Republic regime. University is not garrison ! With presence of students from universities in Tehran , students gathered to commemorate " Shanzdahe Azar " ( the Student Day ) . In a call by " Daftare Tahkime Vahdat " an students organization, students gathered in Tehran University to commemorate " Shanzdahe Azar " the student day. 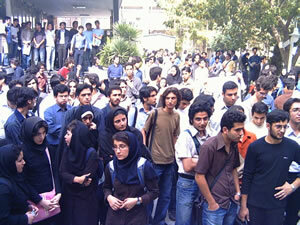 At the time of gathering , they were preventing students other than Tehran University students from entering to university, but gradually with an increase on the number of students and their move towards the western gate of the university the number was increased and the students outside as well as inside the university broke the gate and entered the university. In this student gathering which took place beside " Danesh-kade Fani " (Technical College ) of Tehran University, more than 1500 students from all over Tehran universities were present, Mr. Taghi Rahmani a " Meli Mazhabi" activist was the guest speaker , he spoke about the three students that were murdered on Dec. 7/ 1953 and complaint about the problems that students face today in universities. Mr. Rahmani spoke about the need in unity among all students and social movements. Mr. Ali Niku-Nesbati , member of central council of " Daftare - Tahkime -Vahdat" who was harrassed this morning while entering university by " Herasat forces" ( the ear and eyes of the regime ) blame Ministry of Sciences action toward students and condemned the creation of security atmosphere for student union and activists. Mr. Mehdi Aminizadeh , one of the student that has star beside his name in the students list , and who was banned to continue his remaining school year in university as a representative of students with star beside their name was another guest who in speaking condemned for banning students to continue their education. So many police forces were present in and around university . IRAN: Two journalists detained, national weekly suspended for "ethnic insult"
IRAN: Deux journalistes arrêtés, un hebdomadaire national suspendu pour "insulte ethnique"
Two journalists detained, national weekly suspended for "ethnic insult"
(RSF/IFEX) - Reporters Without Borders has condemned the arrests of two journalists, Shirko Jahani and Hussein Saidpour, and the suspension of a weekly newspaper amid mounting pressure on the media that has prompted five provincial newspapers to stop publishing in a gesture of protest. "The Iranian authorities have once again shown that repression is the only policy they know how to adopt towards the media," the press freedom organisation said. "This harassment must stop. We call for the immediate release of Jahani and Saidpour." 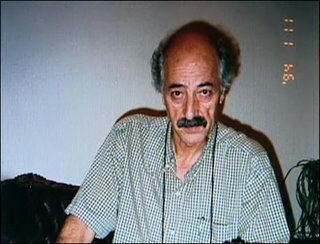 Jahani, who is the correspondent of the Turkish news agency Euphrat in the northwestern city of Mahabad, was summoned on 27 November 2006 to the local prosecutor's office where he was immediately arrested on the city prosecutor's orders for writing critical articles that were published in the foreign press. Jahani also belongs to an organisation founded by fellow journalist Mohammad Sedigh Kabovand that defends human rights in the Kurdish part of Iran. Jahani's wife told Reporters Without Borders that he went on hunger strike after refusing to pay bail of 5 million tumen (about 4,000 euros) in protest against the arbitrary nature of his arrest. He is currently being held in Mahabad prison. Saidpour was arrested on 28 November and the national weekly he edits, "Sepass" ("Thanks"), was suspended over an alleged "ethnic insult" after inhabitants of the southwestern province of Lorestan protested that one of the answers to the latest issue's crossword was offensive. In an attempt to defuse tension as students staged protests against the newspaper, the Press Surveillance Commission ordered its suspension and the Tehran prosecutor issued a warrant for Saidpour's arrest. He is reportedly being held in Tehran's Evin prison. 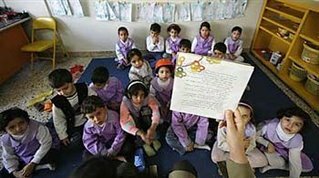 Five pro-reform and independent weeklies in the northwestern province of Zandijan - "Payam-e Zanjan", "Bahar-e Zanjan", "Seda-ye Zanjan", "Alborz-e Khorram" and "Mowj-e Bidari" - meanwhile announced in a joint statement that they have decided to suspend publication in protest against the Mahmoud Ahmadinejad government's repressive policies towards the media, above all the restrictions and judicial harassment.
" Daftare Tahkime Vahdat " is the Union of Islamic Students Association all over Iran . 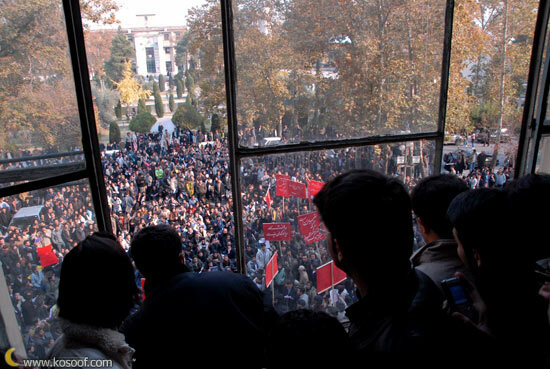 In a statement, the students union has invited Students, independent professors , intellectuals, civil rights & political activists , political parties and other civil rights organizations to participate in a protest gathering with the slogan " University is alive" , once more to emphasize on the need for a "broad front of civil resistance in defence of university"
Where: Revolution square - University of Tehran - in front of " Daneshkadeh Fani"
Iranian photojournalist Jahangir Razmi was working for " Etelaat"newspaper at the time, took 70 pictures of an execution in Kurdistan on Aug. 27, 1979 by Islamic Republic regime in Iran . One picture (No. 20, below) won the Pulitzer Prize. It was, however, awarded to an unnamed photographer -- the only anonymous recipient in the 90-year history of the award. Mr. Razmi preserved 27 of the photos on a contact sheet and stowed it away in his home. Below are those photos -- made public for the first time.